We’ve developed it using the Tableau Web Data Connector trick explained here. Download and deploy this data connector to your Tableau Server once and you’ll be able to use it in any number of dashboard hosted on that server. To use it, insert a Web Page component to your dashboard and point the URL to the Web Data Connector. The solution only works when the dashboard is published to the Tableau Server and accessed through a browser. By default the counter will count down from 10 seconds then calls the refreshDataAsync API call to reload the data behind the dashboard before starting a new count down (Like how Russell did few years back). The counter can be customized (seconds, colors, size, etc.) in a user-friendly way with the use of parameters defined in Tableau Desktop. All this is achieved without the need to embed the Tableau Dashboard into any other web page, which is the beauty of this solution. How many days until the Tableau On Tour Conferences? The good news is that I’ve already done the hard work for you for step 1, while step 2 you’ll only need to do once for each Tableau Server you wish to this on. Step 3 is the easiest step by far and can be done with the same ease for any number of dashboards. Last but not least, step 4 is completely optional the default values are working just fine but if you want to customize the counter you can do it. ===== !!Note!! This command is going to be deprecated, please use whitelist_webdataconnector command instead. You can ignore the warning about the deprecated command, it’s not going away any time soon. Note down the URL which was returned from the command. If you normally access the Tableau Server with a DNS address make sure to update the URL accordingly. Unless you use a custom port for running your Tableau Server (ie. anything apart from :80 for http:// and :443 for https://) you can leave out the port. Once you have the final URL feel free to test it in any browser. You should see the green counter with the default 10 seconds label on it and while it’s not doing anything that’s normal at this point. If you see the green circle then you are good to proceed. The Tableau Dashboard is going to be the one which will start it once it is loaded. 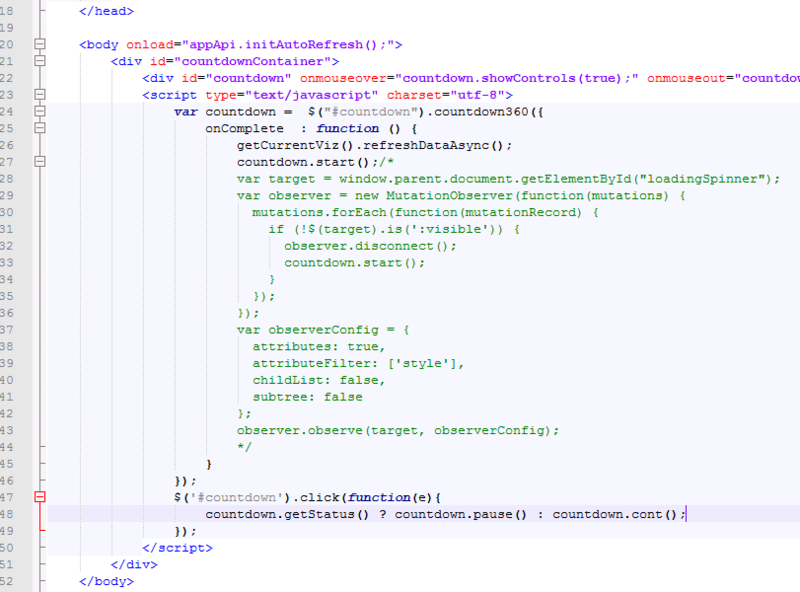 If you are familiar with your browser’s Developer Tools you can manually start it with the countdown.start() command in the console, but that’s not required, you’ll see it in action in just a second. Okay, now that the technical prerequisites are done the rest of this guide are going to be much simpler I promise. At this point, you should have the direct URL of the Web Data Connector which you imported in the previous section. Open up Tableau Desktop and either open an existing Workbook or create a new one with any data in it, it doesn’t really matter. Go to Dashboard view and add a new Web Page object with the URL pointing to the Web Data Connector. That’s it, I told you it’s going to be really simple. If you publish your Dashboard at this point, you’ll have the counter working with its default values (10 seconds timeout, 30px radius, green color palette, etc.) and if you are happy with these defaults then you can call it a day. If not, read along. autoRefresh_label: The label to display below the counter. Two labels are expected separated with a comma, one singular label for the second (ie. second or sec) and a plural label for anything more than that (ie. seconds or secs). If left blank or only a single label given no labels are going to be displayed. For any color related parameters, use the HEX color code starting with ‘#’ – there are dozens of color pickers online, search for one if in doubt. Create a parameter in your Tableau Workbook for the one your are not happy with the default value, eg. autoRefresh_radius. Just to recap, only for the options you wish to override you’d need to create a parameter for, with the rest you don’t need to bother. For the sake of completeness I would like to share a couple of things about how it’s all wired up under the hood, so you’d have a better understanding if you’d need to dig into the code. When the Dashboard is launched with the Web Data Connector in it, the <body onload="appApi.initAutoRefresh();"> (line #320) will be the one triggering the whole event chain, that function is defined starting from line #301. The countdown._drawCountdownShape and countdown._drawCountdownLabel are only there so that in Tableau Desktop you’ll see at least something when the component is first added to the Dashboard, those lines can be safely removed if you are not worried about that. The initAutoRefresh() does two more things apart from all this: subscribes to the event of parameter value changes ( onParamChange) and reads the current list of parameters ( getParameters). They both eventually will reach the processParam function which handles all parameters. Once all parameters are processed for the first time the countdown will be started at line #251. How I ended up tackling this is that I used the MutationObserver so I can detect DOM changes. This MutationObserver is supported from IE11 and all other modern browser – Tableau 10.x also only supports IE11 and above from Microsoft’s browser so you should be good to go. If you need this solution for older Tableau versions and therefore need support for IE10 and earlier, you’ll need to tinker what this bit (or you might as well upgrade your Tableau Server to a newer version, right?). The MutationObserver will look for the loadingSpinner element – as its name suggests that’s the spinner what you see when the dashboard is loading. Once it’s done, it will start the next countdown. Have most of my BI experience with Tibco Spotfire, but interested to learn more about other BI tools and data visualization platforms too. When I'm not building new reports I also quite enjoy getting my hands dirty and muck around with the back-end to understand how things work. Thanks for sharing this interesting technique. Curious if you guys have explored the security implications of the ‘trick’ required to get this to work. Does installing those items on the Tableau server allow any user to execute arbitrary JS code? Only the administrator can import these plugins with tabadmin commands. It’s secure, however, your administrator must check every to be installed plugins. When they are uploaded it is just a static html page, it can do only what is coded in it. Is there a way to implement such a solution in Tableau Online as well? This feature sounds very interesting. Can you please guide on how you have implemented this? This is really great, thank you Alex! Do you know if it Is it possible to have it export the detailed/full data instead of the just the summarized data? Great! Thanks for sharing. I’m wondering if the ‘Export to Excel’ plug in will work for filters or not? Hi Tamas, great work! Thanks for sharing. 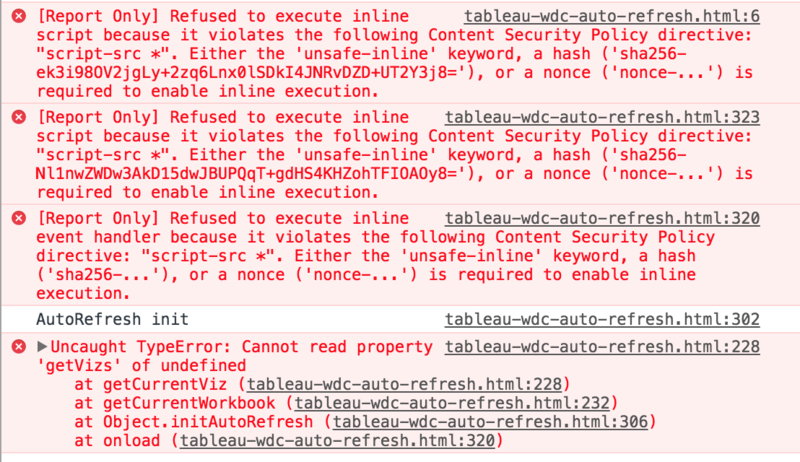 But I come across a problem when I published the workbook with web data connector. It didn’t show up in the tableau server with the error message “url must start with https://“. My url is what the server returns to me, it’s like http://myserver:80/webdataconnectors/counter.html. Do you know what’s going wrong? Thank you. This is really awesome we are using the Refresh circle, it works great, there is a problem though we have 3 Action URLs on the Dashboard how to handle those with the Auto Refresh Circle? Thanks for the solution, this seems great. But I am facing a challenge, when I am moving to other dashboard/tab and then coming back, the timer is getting reset. Please let me know if is there any way of stopping it from getting reset. Really a great approach, worked well for me. The only difficulty I have is, once the count reaches to zero, the next countdown is not starting by itself. I need to reload the page and only then the countdown is starting. I might be missing something, please help me with this. It should be restarted. Can you paste the logs/erros from your Chrome Developer console? This approach seems good, I would like to try it – could you help me with implementation? I Use Tableau Server 10.4 in local network. Dashboard is live-connected to DB, so password to DB is needed for the first time. Client & Server running WIN10. I have loaded the object onto my server and have placed it into one of my Tableau workbooks. I can get the object onto my dashboard, but the counter is not moving. Is there something that I missed? Ant help would be appreciated. This is amazing and exactly what i needed. ideally i would like to set my dashboard to refresh every 15 minutes. obviously i can set the refresh seconds to 900 and everything works fine. is there a simple way to get the counter to countdown from 15 as minutes rather than the seconds value. Also noticed that when i view the report in tableau server this all works perfectly, however most of my clients access the report from publishing the share URL and this doesnt seem to work. What versions of Tableau Server is this? doing a bit more investigation it looks like i need to add a couple of elements to the html file but i am unsure where to add them. Have you ever tried to get this working when the dash is viewed via the Tableau iOS app? seems to just render the timer but doesn’t start counting down. Any help would be much appreciated! Hi Tamas, no worries. I looked a little deeper and it seems :embed views and views rendered in the iOS app don’t appear to have VizManager available in parent.parent.tableau. 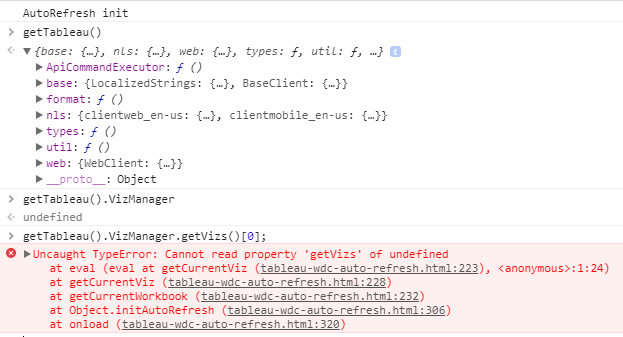 I was specifically after the refresh functionality and found that parent.parent.tab.ToolbarServerCommands.refreshData(); for embedded views does the same as parent.parent.tableau.VizManager.getVizs().refreshDataAsync(); for non embedded views. Still not sure how i’m going to get the countdown timer working on embedded views as i’ve not found the equivalent for getParameterAsync yet. Have you done any work with vqlweb.js? Just wondering if you had got any further with this? It’s a shame that this approach doesn’t work in 10.5! Same for me. Tamas, any idea why that is the case? Hi Norbert, this works great! How would I change from seconds to minutes instead? I would like to use it to refresh my dashboard every 30 minutes. Thank you very much in advance. Can anyone please explain how to enable this with new way of TSM server command line ?? we have Tableau Server v 2018.3 with TSM, so no tabadmin exist !! and I’m wondering which values I can use for –url and –secondry ?? Will it work if there is no internet connection on Tableau Server machine? I see in source code that plugin requires some lib from googleapi.